Last week’s 2014 Finali Mondiali Ferrari in Abu Dhabi may have been dominated by the new Ferrari FXX K, the insane 1,050 hp track-only rolling laboratory that will inform how Ferraris will drive in the future. But let’s not forget the hybrid hypercar that spawned it in the first place, the voluptuous LaFerrari, currently on display at the Ferrari World theme park near the Yas Marina Circuit. 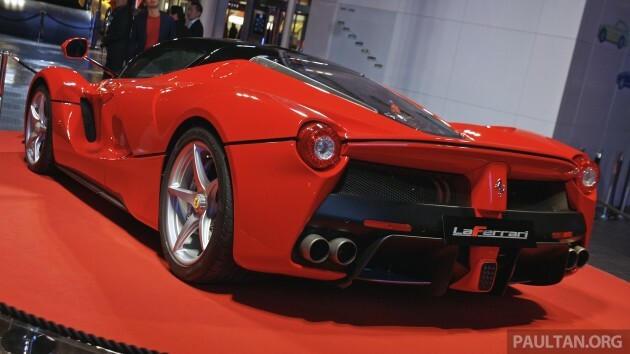 Introduced at last year’s Geneva Motor Show, the LaFerrari differs from the great majority of other cars from Maranello in that it was styled completely in-house, headed by design boss Flavio Manzoni. This is the first road car Ferrari has penned itself in a very long time, and also the first production Ferrari not to be styled by Pininfarina since the Bertone-designed Dino 308 GT4 of 1973. 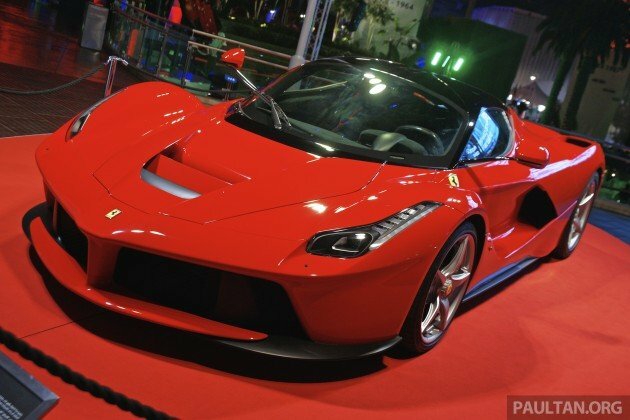 And yet, the LaFerrari looks as heart-achingly stunning as the best Prancing Horses. It looks recognisably like a modern Ferrari, but with large sweeping curves, bold surfacing and a level of detail that give it such a sense of awe and an elegance that is rare on a Ferrari hypercar. The deep black stripe that goes around the car is a particularly nice touch, mirroring the same detail on the 288 GTO, F40 and F50. There’s some science behind it as well, with active flaps at the front and rear diffusers to balance downforce front-to-rear, as well as an extendable rear spoiler hidden under the rear deck. Blending form and function, the bodywork has been designed to deliver maximum downforce with minimum drag. This may cause some contention in the office, but in this writer’s humble opinion, the LaFerrari is one of the most beautiful Ferraris ever built, and that’s saying something with cars like the 365 GTB/4 Daytona, the 250 GTO and late-1960s sports prototypes such as the 330 P4 in the company’s back catalogue. But this beauty is not just skin deep. Under the clear engine cover sits a 6.3 litre naturally-aspirated V12, delivering an astonishing 800 hp at 9,000 rpm and 700 Nm at 6,750 rpm. Coupled to that is Ferrari’s Hybrid Kinetic Energy Recovery System (HY-KERS), with a 163 hp electric motor. Another electric motor drives the engine’s ancillaries. Together, they produce 963 hp and over 900 Nm – shaded by the FXX K’s 1,050 Italian stallions, of course, but this is still the most powerful road-going Ferrari by some margin. Sending all that power and torque to the rear wheels is a seven-speed dual-clutch transmission, enabling the LaFerrari to rocket itself to 100 km/h in under 3.0 seconds, 200 km/h in under 7.0 seconds, 300 km/h in 15 seconds and a top speed of over 350 km/h. It’s clear that a lot of effort has been expanded to make the carbon fibre hypercar as light as possible – despite the battery pack providing the highest specific density of its kind, it only weighs 60 kg. The whole car tips the scales at just 1,255 kg dry, not bad when you consider the already stripped-out non-hybrid 458 Speciale weighs 35 kg more. All this race-bred know-how and engineering culminates in a lap time around the company’s Fiorano test track of 1 minute 19 seconds, four seconds faster than the F12berlinetta, making the LaFerrari Maranello’s fastest road car ever. One of the rarest too – only 499 examples will ever be made, and predictably they are all sold out at a price of €1 million (RM4.34 million) each, before taxes. Desperately want MacLaren to trump Ferrari on the looks but have to admit – grudgingly- that Ferrari has done a better job of creating presence.